Until now, the company has designed 6 video bingos, each with a theme and different characteristics aimed at a wide range of players. 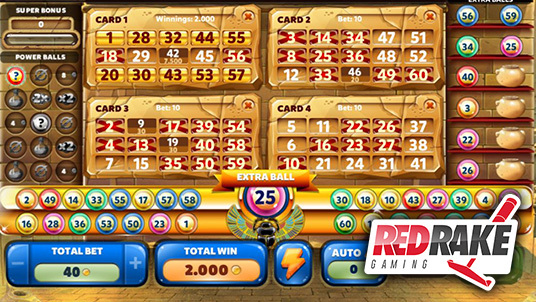 Red Rake Gaming has just released this innovative video bingo where you can delve into the Mysteries of Egypt and discover the Pharaoh´s Tomb with the most realistic graphics. The video bingo contains 4 cards with 15 different prize patterns with 12 extra balls with a wild ball and an extra free ball. In addition to the great new feature, a panel of Mega Balls, it has two bonus phases and a progressive bonus with a wheel of fortune. There is no doubt that a wide range of players will get maximum enjoyment out of this new video bingo.